At Thomas Jefferson Middle School we make art as global citizens. As an International Baccalaureate institution, we embrace world culture through hands on art making. Sixth grade students may choose visual art as an elective. Class is held every other day for a semester, the equivalent of a quarter class, in which students explore ceramics, painting and drawing. Seventh grade students may select visual art for a semester, exploring two and three dimensional art in more depth and building on their sixth grade experiences. In eighth grade, students can enroll in visual art for a semester. After two years of art, students have more skills and experience and are allowed more choice in how they individualize their projects. Act II Visual Art class is offered as an after school class for students who can not take art during the regular school day or who would just like to take more art. Act II is a graded semester class that is included in a students schedule as well as on their report card. 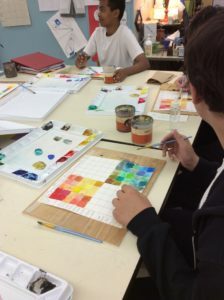 Students work on drawing, painting and sculptural skills as they would in a regular school day class, although planning can be adjusted to accommodate the needs and direction the group wants to take. In the spring session, the first quarter is devoted to designing and making props and sets for the school play.